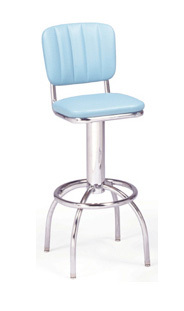 The Model B2T7 bar stool features a swivel seat with channel back, arched legs and foot ring. Available in your choice of standard or designer vinyls. For pricing information on our bar stools give us a call at 304-728-0547. Or send us an email and one of our retro specialist will respond right away. We offer a great commercial customer discount when ordering in large quantities. Let us help you build your diner or retro restaurant.